The world-famous Conservatory at Longwood Gardens will again be decked out in holiday splendor, as Longwood celebrates the holidays, starting Nov. 27. EAST MARLBOROUGH — From elegant trees adorned with feathered friends, to a peacock-themed Masquerade Ball in our Music Room, the holiday season soars at Longwood Gardens November 27 through January 11. Topiary swans grace our Exhibition Hall, while whimsical trees depict the classic tales The Ugly Duckling and The Goose that Laid the Golden Egg. Outside, all eyes are on the sky as illuminated stars twinkle above, colorful fountains dancing to holiday music rise high in the air, and a half-million lights brighten the night. 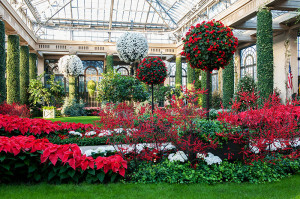 Inside Longwood’s 4-acre heated Conservatory 16,000 seasonal plants, including poinsettias accented with amaryllis, lilies, begonias, cyclamens, and hydrangeas flourish. Elegantly decorated trees sparkle with festive, bird-inspired ornaments. Throughout the Conservatory guests will encounter a host of decorated trees, some reaching as high as 22-feet. The Music Room décor is inspired by a Peacock Masquerade Ball, with elegant table settings, elaborate paper art, and an 18-foot rotating peacock-themed tree. Artisan touches throughout the Conservatory add to the elegance of the holiday season. Wood turned birdhouse ornaments and hand blown glass hummingbirds adorn the Rose House, while glittering glass bird baths line the Fern Passage. Celebrate the sounds of the seasons during A Longwood Christmas, featuring free and ticketed holiday-inspired performances. Sing along to the sounds of the season during daily live performances played on Longwood’s grand 10,010-pipe organ. Additional free holiday performances from choirs and performers add to the festive holiday feel. Longwood works its holiday magic outdoors, too. More than 500,000 outdoor lights adorning 124 trees in classical and free-style forms enchant both young and old. The lighting extravaganza includes the addition of lighting select trees in the eastern portion of the Gardens near the picturesque lakeand in Longwood’s new Meadow Garden. Fountains dance day and night to holiday music in the Open Air Theatre (weather permitting). Young and old will delight in Longwood’s outdoor train display in its new location near the Birdhouse Treehouse as it travels past miniature Longwood landmarks lit for the holiday season. Natural edible ornaments adorn the Wildlife Tree created especially for Longwood’s feathered and furry friends. In Longwood’s historic Chimes Tower, the 62-bell carillon plays holiday music every half hour. Strolling performances fill the gardens with holiday music on weekends. On New Year’s Eve, Longwood offers a variety of performances for the entire family. Organ music fills the Ballroom from 3-9 pm; Rob Dickinson and the Brandywine Christmas Minstrels perform from 2-8 pm; Barbershop Quartet Frank the Dog harmonizes throughout the conservatory from 6-9 pm, while the upbeat Parti Gras performs from 4-9 pm. Admission to the Christmas display is by Timed Admission Ticket, with tickets purchased in advance for a specific date and time. There is no admittance to the gardens without a timed admission ticket. Guests should buy their tickets before arriving at the Gardens to ensure admittance. Tickets are available now and can be purchased online at www.longwoodgardens.org or in person at Longwood. Please note: Longwood will host Member-only Holiday Evenings on Mondays, December 1, 8, 15 beginning at 5pm. Only Longwood Gardens Members will be admitted on these exclusive evenings.